Every month we send our XOXpert Street Team a hefty box of books to review, read, and love! In February, we sent them a bunch of amazing reads, including LEGEND by Katy Evans, DIRTY RIDE by Chantal Fernando, and LAST RIDE TO GRACELAND by Kim Wright. Check out their rave reviews of these titles below! LEGEND: Review by Chrissy F.
This series has come full circle with Legend being the last book. My heart hurts that this series is over, but at the same time, Legend packed the same amazing punch that we got in Real! In Legend we get to meet Maverick who enters the Underground scene with no one wanting to train him, and no one wanting to coach him. When a beautiful girl at the gym says “he’s with me” so he can train and gives him a pointer on how to find a coach, he’s not only happy to have someone to finally coach him, but drawn to this girl like nothing else. Reece is spending the summer with her cousin Brooke, Brooke’s husband Remy, and their son Racer, while they travel for the fights. She’s working on finding herself, and never expected to meet Maverick, or the consequences of falling for him. Maverick is fighting to avenge his legacy, and is working on finding himself as well. His eyes are set on bringing Remy down, problem is, Remy wants to help him, train with him, and take him under his wing. Maverick fights this tooth and nail at first, but soon even though he wants to beat Remy in the finals, he learns to respect him and even though he hates to admit it, he looks up to him. When he realizes the girl he wants is Brookes cousin, he thinks he’s been played, but their attraction to one another is something that can’t be faked. Reece and Maverick do a lot of growing in this book, and it may seem like their bond and relationship moves fast, but it happens over weeks while doing the Underground circuit. I loved seeing Reece thinking she had to change to get a guy she wanted, when the guy she never expected wanted her for who she was. Together they are powerful and I loved their story. I loved how the accepted each other, and their pasts and who they were and didn’t really let it get in the way of them. This story is full of acceptance, love, and finding yourself. I loved Maverick as much as I loved Remy, and Reece is an amazingly strong character. The things she’s been through at such a young age already, proves she’s stronger than anyone gives her credit for. She fights for what she wants, just like Maverick does, and together their story is full of strength, courage, love, and rising above. I adored how much Remy played a part in this book, and not only did Katy Evans give us a perfect book to an amazing series, but a perfect goodbye to Remy. Even though this book isn’t an emotional one, I find myself emotional knowing this is the end of the Real Series. I fell in love with Real and Mine, and then I enjoyed the other books, but Legend reminded me of how much I adored these characters, and why this series is a must read for anyone looking for the perfect series. The ending to this series is bittersweet, yet perfect. 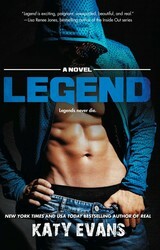 If you’ve read Remy’s books (Real, Mine, Remy) you have to read Legend, trust me on this. DIRTY RIDE: Review by Katrina T.
This is the first book I read in this series, and I’ll definitely be going back to read the rest of them. I’ve read a few MC books, and this is definitely one that I’ll be adding to the ranks. I loved the intensity between Valentina and Arden. It’s like things line up for them. I did question how she could go from the situation she was in to seeing where things go with Arden, but it’s a novella, and I knew it needed to happen fast. The steamy scenes are hot, and I love alpha males. But I like it even more when the girls make their wants known. The romance is fun, intense, and full of surprises. And I love the friendships that Valentina makes. She definitely needs some pals she can rely on. Overall, it was a good novella, and I need to go back to read the first books in this series so I can meet the other members of the Wind Dragons MC Club. LAST RIDE TO GRACELAND: Review by Kathy A. Last Ride to Graceland is a touching story about a daughter seeking the truth about her mother’s past. This was my first book by Kim Wright and I really enjoyed this. Cory Ainsworth is a thirty-seven-year-old blues musician. It’s been less than a year since her mother passed away when she discovers Elvis Presley’s Stutz Blackhawk hidden away in their South Carolina home. The car is in mint condition and contains unusual clues from her mother’s past as one of Elvis’ back-up singer. Her mother, Laura aka Honey, fled Graceland on the day of Elvis’ death and never spoke of her time with the King. Cory has always wondered who her real father was so with the help of the clues Cory goes on a road trip. She intends to return the car to Graceland but follows the unusual route her mother took 37 years ago to get back home. A journey to find the truth of her father makes a surprising twist for Cory. By discovering her mother’s past Cory comes to an understanding that she and her mother weren’t as different as they had appeared to be. The characters of Last Ride to Graceland were fun and easy to relate to. Cory is lost and makes ends meet by singing at a bar. Her passion for music comes from her mother but we see that they clashed. This is a typical mother-daughter relationship that anyone can identify with. Cory is a likeable character and it is no surprise that the strangers she meets gravitate to her. This journey forms a stronger connection with her mother and also we see Cory get a grip on her future. The story is written in dual POV, alternating between Cory and Honey in 1977. The author also mixes in Elvis’ last days. I was 6-years-old when Elvis passed away. At the time I didn’t understand who he was but I can recall how devastated my mother was by his death. The author’s historical facts are a unique tie into Honey and Cory’s story. There were humorous, heartbreaking and touching moments. 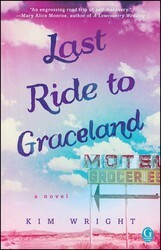 I recommend Last Ride to Graceland for fans of women’s fiction and heartwarming mother-daughter stories. Mav falls for the enemy, a girl he's supposed to stay away from. Can love really conquer all? Great reviews Chrissy and Kathy. I also loved Last Ride to Graceland. Elvis passed before my time, but I grew up watching his movies and loved him. I loved that bit of history twist in it. Great reviews Katrina and Kathy!! I definitely need to start Last Ride to Graceland after that review!! !